In the last couple of weeks, New York magazine, New York Times, and Forbes have reported on the international trend of yarn bombing “ subversive textile street art created by knitters and crocheters. Well before mainstream U.S. media discovered the colourful phenomenon, there was Mandy Moore and Leanne Prain‘s 2009 guide on the subject, Yarn Bombing, published by Vancouver’s Arsenal Pulp Press. According to Arsenal Pulp marketing manager Cynara Geissler, sales for the book have risen, thanks to the attention. 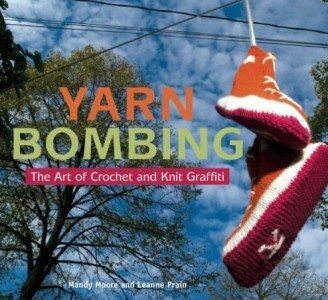 Yarn Bombing is now in its third printing, and is currently listed as Amazon.com’s 12th bestseller in the crafts and hobbies category, and ninth on the Canadian list.